Enjoy these tasty scones perfect for a weekend brunch. Recipe courtesy of Carr Manor. 1. Heat oven to 425. Grate 8 Tablespoons or frozen butter on large holes of box grater. Put grated butter in freezer until needed. Melt 2 T of remaining butter and set aside. Save remaining frozen butter for another use. Put blueberries in freezer until needed. 2. Whisk together milk (or half n half) and sour cream in medium bowl; chill til needed. Whisk flour, 1/2 cup sugar, baking powder, baking soda, salt, & lemon zest in med bowl. Add frozen shredded butter to flour mixture and toss with fingers until just coated (it is important to touch the ingredients as little as possible as the heat from your hands will soften the butter). 3. Add milk mixture to flour mixture; fold with spatula till just combined. Transfer to liberally floured work surface. Dust dough with flour; with floured hands, knead dough 6 to 8 times, until it just holds together in ragged ball, adding flour as needed to prevent sticking. 4. Roll dough into approximate 12" square. Fold dough into 1/3 like a business letter, using bench scraper or metal spatula to release dough if it sticks to countertop. Lift short ends and fold into 1/3's again to form approximate 4" square. Transfer dough to plate lightly dusted with flour and chill in freezer 5 min. 5. Transfer dough to floured work surface and roll into approximate 12" square again. Sprinkle blueberries evenly over surface of dough, then press down so they are embedded in dough. Using bench scraper, loosen dough from work surface. Roll dough, pressing to form tight log. Lay seam-side down and press log into 12" by 4" rectangle. Using sharp, floured knife, cut rectangle crosswise into 4 equal rectangles. Cut each rectangle diagonally to form 2 triangles and transfer to baking sheet. 6.Brush tops with melted butter and sprinkle with remaining tablespoon sugar. Bake until tops and bottoms are golden brown, 18 to 25 min. On wire rack cool 10 minutes, then drizzle with glaze. 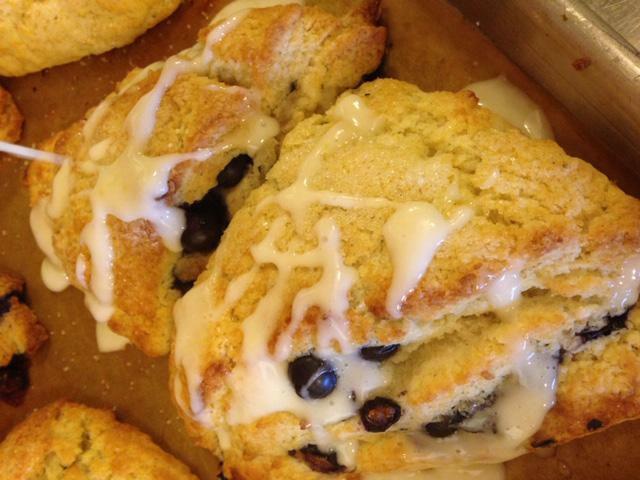 Make Ahead: Put scones on baking sheet, either refrigerate them overnight or freeze. To bake, for refrigerated, heat oven to 425 & follow step 6. For frozen, heat oven 375 & bake 25 - 30 min.